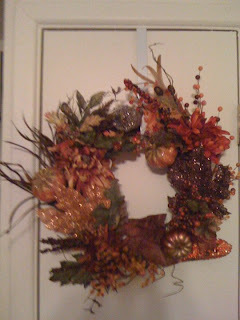 I have recently realized that I LOVE TO MAKE WREATHS! They are probably my favorite craft overall to do! I started out making my very first wreath for my grandmother's bathroom. I had always wanted to make a wreath but never really got the chance, so with my first one I just went for it....not really knowing what I was doing. 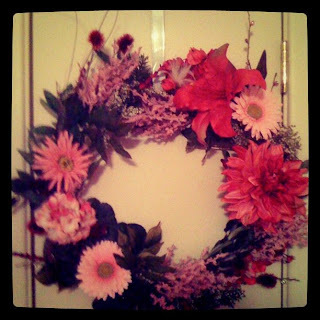 My grandma had redone her bathroom in bright springy colors, and had a daisy shower curtain so I made this wreath to decorate the wall in there. 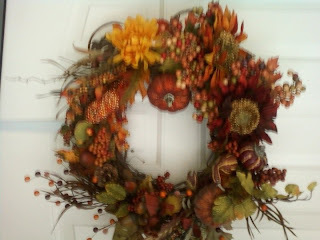 Then over a year later after I was married, Fall came...which meant I got to decorate my house with some colors! (which is my favorite!) 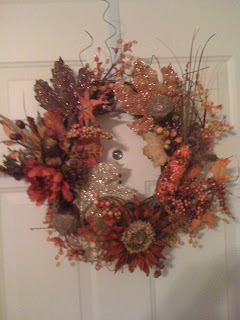 So I decided to make a wreath for my house, and this is what I came up with! All the decorations were bought from Hobby Lobby. After showing the wreath to my friends, I made the next two which they bought from me! 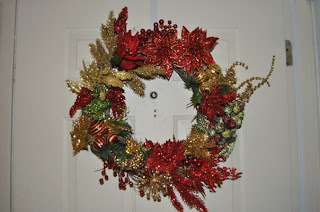 Then came Christmas 2010...which meant I had another opportunity to make a wreath to decorate my house. 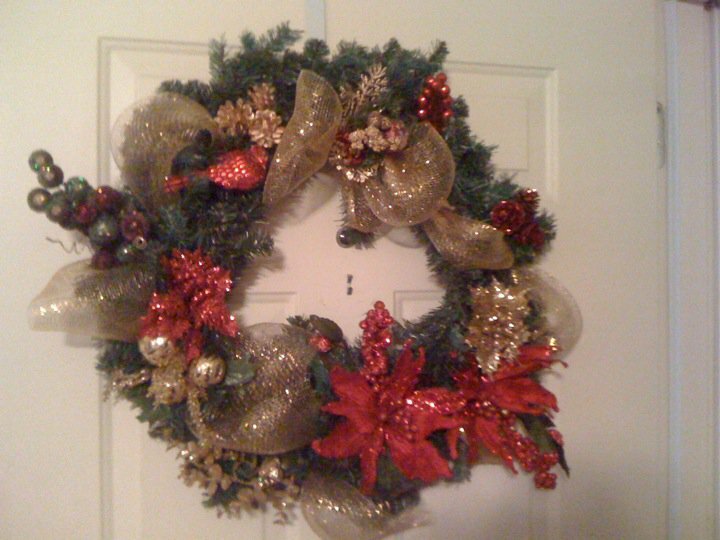 This is the one that hung on my door for the holiday season, and I loved looking at it every day! 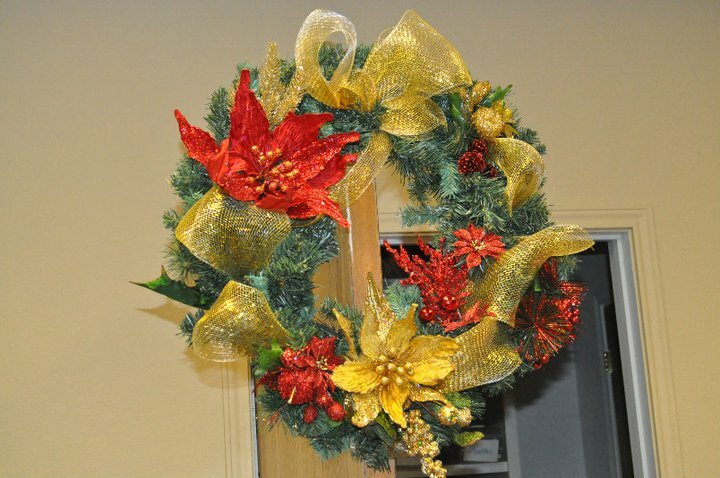 Then the same two people got me to make them one also... and I did those a little different, adding some Christmas ribbon through out the wreath and less flowers. Now it is summer time and this is one I put together for my friend last weekend. She wanted something that would work for Spring and Summer, and she loves pink. She helped me pick out flowers that she liked and I put it together for her! I like the way it turned out. This was my fun project I worked on last night! I found the idea on the blog tatertots and jello and loved it so I had to make it! Plus it was only a $4 project....(it helped that I had the ribbon and scrapbook paper already) Anyways, though, I got the wreath and red hots at the Dollar Tree. It's a little different being made out of red hots, but so much fun for the 4th of July! The little rocket is made from a toilet paper roll with scrapbooking paper and ribbon! This was my own little touch! I have been seeing these cute banners all over blogland and have loved them! So I decided to add this using the same papers i used on the rocket! And this was the finished product! I'm loving it! This is the next wreath I want to make! This is from Corner House blog! I love that it is made from old books....and I have several waiting to be cut into...all I need now is something that cuts 3 inch circles. I have been looking but haven't quite found what I need yet! Anyways, I just thought....since it is Wednesday and I am obviously obsessed with wreaths, then I would make it a SHARE THE WREATH WEDNESDAY!